A door mat. Simple, clean and safe. The lowly door mat, so often over looked, can provide your family, customers and clients with a positive first impression of your home. I have a passion for stopping dirt at your door! I've sold home and commercial door mats since 1998 on StopDirt.com, making thousands of entrances safe, clean and attractive. Let me help you stop dirt at your door. Would you benefit from an Anti-Fatigue mat? Four easy questions to help you know. These four simple questions will help you determine if an anti-fatigue or cushioning mat is right for you. 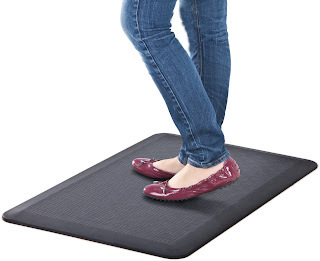 In many cases, anti-fatigue mats can help reduce pain and discomfort in standing situations. 1. How long will you be on your feet? Whether you are washing dishes, cutting hair or working at a counter, standing can hurt. If you will be on your feet for more than 10 minutes at a time, using an anti-fatigue mat can be a benefit. 2. Can you place your mat somewhere out of traffic? Most anti-fatigue mats have tapered edges to prevent tripping. But using an anti-fatigue mat in a high traffic area can wear the mat prematurely and become an obstacle for wheeled traffic. If you have a place out of the main traffic flow where you can place your anti-fatigue mat, this will be ideal. 3. How hard is your standing surface? Concrete, tile, and stone are the hardest surfaces that can result in the most discomfort. Vinyl or wood flooring is also hard on feet. A plush carpet or matted surface will give more organic comfort The harder your surface, the more you need an anti-fatigue mat. 4. Do you move around a lot? If you are standing in the same spot for longer periods of time without walking or moving, you will feel immediate benefits for using a quality anti-fatigue mat. The key identifying feature of a good quality vinyl loop mat is that is is unbacked. This means no solid slab on the underside of the mat. A good vinyl loop mat will be thick -- at least a half inch -- to stand up to heavy foot traffic, and it will have a beveled edge for safety. And importantly, a vinyl loop mat will have an open back to allow debris and water to flow through the mat to the cement underneath. Vinyl loop mats with open-back costruction are used exclusively outdoors, because the mat simply sifts dirt and debris to the bottom. This makes for easy outdoor cleaning. Simply lift and sweep! 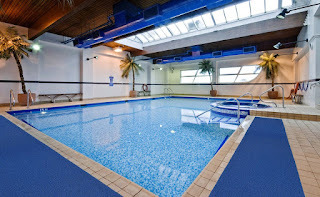 Our Wayfarer brand vinyl loop mats are highly durable, anti-microbial to resist mildew and easy to hose or shake clean. 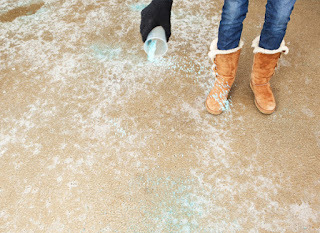 Will Rock Salt and Ice Melt harm your Interior Floors? Salt is an easy and effective way to melt dangerous ice and snow. Used outdoors, rock salt and commercial ice melt can be a great way to prevents slips and falls. However, what happens when this rock salt is tracked into your building? Dark spots can form on your carpets. Additionally, hard surfaces such as wood or tile, can become slick. How can you enjoy the outdoor benefits of using an ice melt without sacrificing your indoor flooring? Use an outdoor rubber scraper mat to stop most of the salt from entering your building. Once inside, use a walk-off interior mat. We recommend a launderable mat for winter traffic. The mat will trap and maintain the rock salt before it reaches your floor. Vacuum your mats frequently throughout the day to remove excess salt. When possible, wash mats in using hot water or use a hot-water extraction cleaning. Our Classic Carpets mats are 100% launderable and great for high traffic areas. The benefits of using a salt ice melt certainly outweigh the disadvantages. With a little attention, you can be sure that both your exterior cement and your interior floors are safe and protected. We are especially grateful at this time of year for our fantastic suppliers in Salt Lake City, Utah, in Chino Hills California, in Lenexa Kansas, and in Lagrange Georgia for the quality products we are able to offer to our customers and friends. We are happy to still offer made-in-the-USA quality mats. Thank you for your support and loyalty this year. Merry Christmas to all! Unique disk pattern on back of mat keeps it in place on hard floor surfaces. Like a suction cup! Also available with cleated backing for carpeted surfaces. Many of my "back east" customers are calling. They are getting ready for the inevitable coming of snow, ice and water at their door ways and in their garages. What can you do to ready your entrances for winter? The first line of defense is an outdoor mat. For this time of year, we recommend using a non-absorbent rubber mat outdoors, paired with an absorbent indoor mat. This tag-team combination will give you the best protection for your floors and doorways. Your non-absorbent outdoor mats will provide scraping action and slip protection, but won't also absorb the season's falling rain and snow melt. That's the good news! But the non-absorbent outdoor mat also won't dry shoes. That's where you'll want to pair your mat with an absorbent one inside like the Waterhog Premier door mat or the Classic Carpets entrance mat. Pairing with an absorbent indoor mat definitely offers you the best coverage. But what about your garage? That first magical day of snow can soon wind up as a puddle on your garage floor, creating slip hazards and messes. You want to use the same rule of thumb as you use in your entrance -- and outdoor mat and indoor mat, when possible. But if you anticipate a lot of snow melt off your cars, you'll need to take it one step further. A containment mat works wonders for heavy snow areas. Or for smaller wet areas, an oil absorbing mat can double as a water absorber also. Who Needs A Sticky Mat? Maybe you've seen these peel-off sticky mats on the basketball court? Or perhaps at the door way to a medical office. But did you know that adhesive tacky mats are used in lead paint removal? New EPA Lead Abatement Regulations require measures to minimize dust on worksites. Often home and commercial remodels of structures that are older than 1978, require lead paint removal. Our tacky mats help keep carpets and floors clean. Where else are sticky mats used? Cleanrooms, microelectronics, printing presses -- and of course -- basketball courts are popular uses for this mat. Is a garage containment mat right for you? 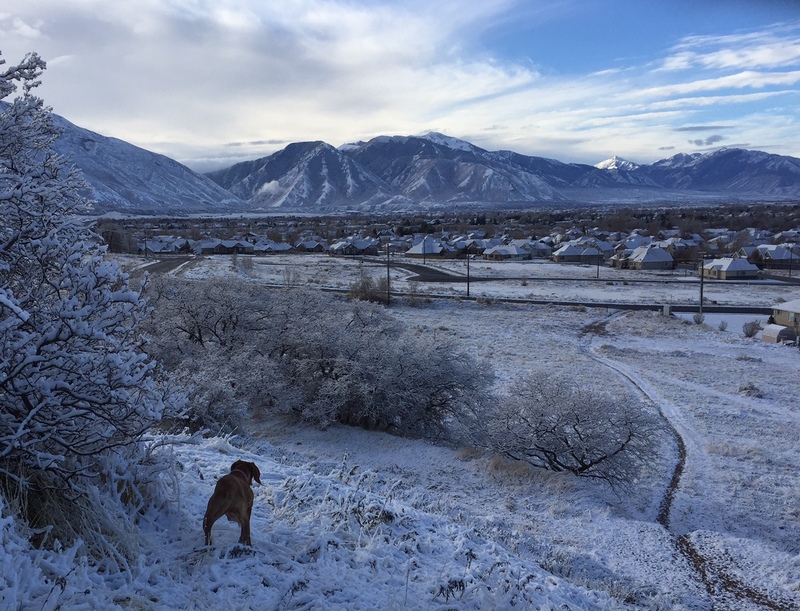 It's not quite winter yet in Utah. But the colored trees on the mountain remind me that soon the snow will fly. That means the snow will also get tracked into the garage. The worst part of winter is when I pull my ice-and-snow covered car into the garage, only to come out later to find a grimy puddle of water under the car. Or worse yet, melted snow all over the garage. Want to contain that water? Then the Clean Park is perfect for you. This sturdy vinyl sheet snaps onto raised edges to form a container for melted snow and water. The edges are tough enough to stand up to your tires driving over it. What can a containment mat do for your garage and home? 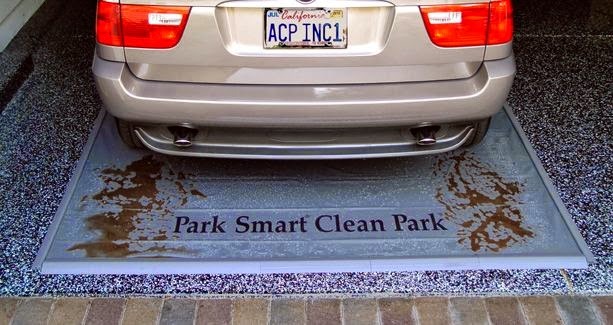 The Park Smart Clean Park mat catches every drop of mud, snow and grime that falls off your car. This keeps the garage floor clean and eliminates the problem of tracking mud and grime into your house. For best results, you want to choose the right size Clean Park for your garage and car. Unlike some of our other garage flooring products that are designed to fill your garage from wall-to-wall, the Clean Park is a containment mat made to fit your car only. Because the Clean Park can be slippery when wet, it is recommend that you choose a size that will enable you to easily park your entire vehicle on the mat while still allowing room for a walkway around your vehicle. The idea is that you park ON the mat, then step OFF the mat when getting out of the car. More good news: After listening to customer surveys and feedback, we've made a design change. No more big letters. The Clean Park logo will now be only small and more subtle on the edge of the mat, as pictured above. Even more to enjoy! Take good care of your door mat and it will take good care of you.Cleaning a door mat is easy, especially when you use a quality rubber-backed entrance mat. Weekly: Vacuum, sweep or shake it off. This is easy. Just do your weekly door mat cleaning at the same time you sweep or vacuum your other floors. Seasonally: Machine wash or hose off your mat. Many of my StopDirt.com mats can be laundered in your home washer or commercial washer. 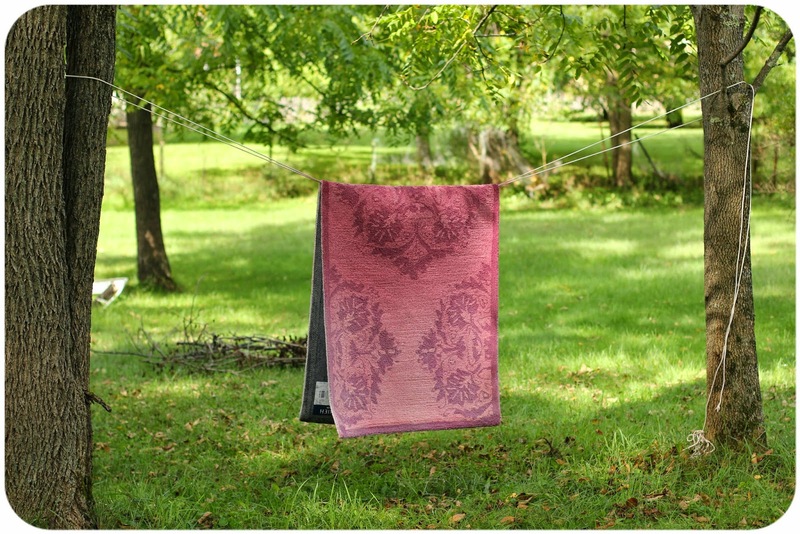 For rubber mats or non-launderable styles, take it outside and hose it off. If the mat is really dirty, consider taking it to the car wash to power blast it. Hang to dry. Bigger is Better! How many feet of matting do you need for the best floor protection? For commercial entrances, go for 15 feet of matting. This ensures that each foot will make contact with the matting at least three times. For home use, where you may not have room for 15 feet, consider using both an indoor and outdoor mat for better floor protection. I cringe a little when I see a tiny 18-inch door mat. That might work well for under pet dishes or to catch splashes next to a sink. But for your doorway, bigger is better. 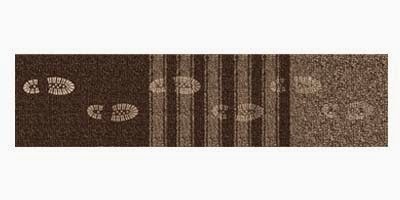 Your carpet and floors will stay much cleaner with each step that passes over your entrance mat. 1. Sweep everywhere. Move all decorations and furniture. Get that broom out and sweep away all the winter dust, grime, cobwebs and critters. 2. Wipe down the door. Use warm water and a mild cleaner to clean the nooks and crannies of your door. This is a good time to see if your door needs a fresh coat of paint. For just a few dollars and couple hours of work, you can make your door look like new. 3. Vacuum and hose off your door mat. Hang it to dry. This is also a good time to check your mat to see if it needs replacement. 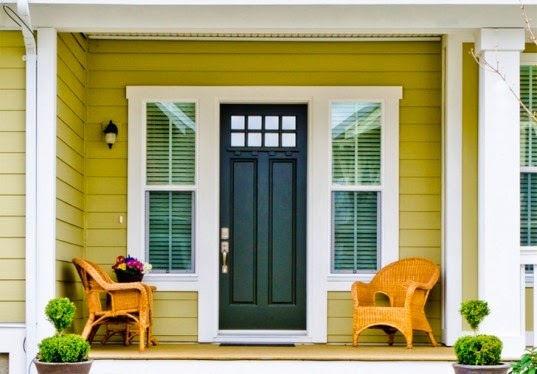 Throw out overly used or faded door mats for a new vibrant, safe front door. 4. Replace your decorations or furniture. Consider switching out your winter decorations for a fresh spring design. 5. Clean all glass. Don't forget to clean inside and outside the glass. Winter is messy. We can help. Here in Utah, we've settled into what I affectionately call, the Smog Death of January. The holidays are over. And our natural Utah valleys create a winter inversion that traps pollution and cold down near the valley floor. Basically, it's dreary and miserable. There is hope... and it's called February and is right around the corner. In the meantime, January is a good time to take a second look at your flooring protection. Hopefully, you are already maintaining a quality entrance mat at your doorway. But what about other areas of your building? Identify high traffic areas. Do people congregate around the snack bar? A particular counter? The copier? Find that high traffic area and place a quality indoor mat such as the Classic Carpet during winter. What areas collect moisture? There are the usual suspects, like drinking fountains and sinks. But in the winter time, moisture is sometimes collected near cold windows or little-used back doors that in summer months don't pose a problem. Consider placing an absorbent mat such as the Waterhog for extra winter coverage. Do you have slippery spots? In summer, many buildings can get away with using one mat only at the entrance. But with winter wet and snow, you may have extended areas that are in need of slip protection. An outdoor rubber scraper mat can work double duty, even inside, during high storm season to protect you and your customers. If I had a magical dog-paw cleaning mat, I would be a millionaire! This is certainly an issue that many of my dog-loving customers deal with everyday: How to keep floors clean with a dog running in and out all day. 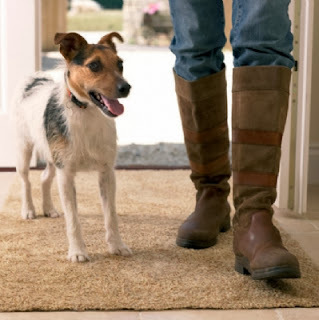 While there is no one "magic dog" door mat, here are a few keys tips to help minimize dirt and grime coming in with the dogs. First, like any matting situation, you should determine what kind of dirt is coming in the door on your dogs' paws. Do you have a lot of mud and wet debris? Or is it mostly dust and dry dirt? If you have wet and muddy dirt coming in the door, you'll need an absorbent mat. My best selling absorbent entry mat is the Waterhog. This product will act as a scraper mat (taking large debris off paws and shoes) as well as an absorbent mat. If you have mostly dry debris coming in with the dogs, you will want a softer, carpet-like mat. Look for one with a twisted yarn top -- like a shag carpet. A mat with a "shag carpet" type surface will grab small, dry dirt. Then the dirt will be sifted to the bottom of the mat, away from the surface, to avoid the dreaded re-track. The dirt will remain on the bottom of the mat until you vacuum or clean it away. A good example of a soft carpet mat is the Classic Carpets mat. Lastly, just like their lazy human counterparts, dogs usually do not pause to wipe their paws on the mat. So follow this rule of thumb when choosing your door mat-- the larger the better. A little 18" x 27" door mat is going to be nothing but a chew toy in terms of stopping dirt. Aim for the largest mat your area can accept. That way, there is more matting surface to clean those pesky dog paws. An internet search connected an arthritic pig and a local door mat distributor, bringing a bit of hog heaven to one really big piggy. Erika Wilde, owner of StopDirt.com, says she receives around a hundred e-mails a day. But there was something unusual about the email she received last week from Yvonne McIntosh at the piggy department at Best Friends Animal Society in Kanab, Utah. 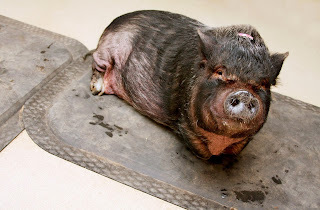 As McIntosh's email explained, Miss Brit, a 100-pound pot bellied pig, needed some cushioned matting for her arthritic front feet. And StopDirt.com had just the product: a cushioning anti-fatigue mat called Hog Heaven. I didn't name the mat, said Wilde. The Hog Heaven is the actual manufacturer's product name. The mat is made in Dalton, GA by a mat mill whose best seller is the Water-hogdoormat, said Wilde. I guess the makers were just trying to stick with the hog theme. The coincidence was almost comical for McIntosh, the pig's caretaker. She was surprised to find a product that her pig needed that was actually called Hog Heaven. Wilde says she sells a lot of the Hog Heaven anti-fatigue mats for offices, but this is the first time an "office pig" will use the mat. Doesn't everyone have an office pig? said McIntosh. Wilde's company donated the matting to Best Friends which is a no-kill animal shelter that on any given day cares for about 1,500 dogs, cats, horses, rabbits, birds and, of course, pigs. We had some cheaply made mats that were really garbage in comparison to the new mats, said McIntosh. I used to have an auto restoration and hot rod shop so I liken the old mats to a junky old car and your mats to a new Cadillac! Miss Brit is about 14 years old, which is "mature" for pot bellied pigs. Brit weighs about 100 lbs. She was obese at one time due to poor care. Because of her extra weight, she suffered damage to her front legs including stress fractures to the bones. She then lost the excess weight and had excess skin on her stomach and was stepping on it. 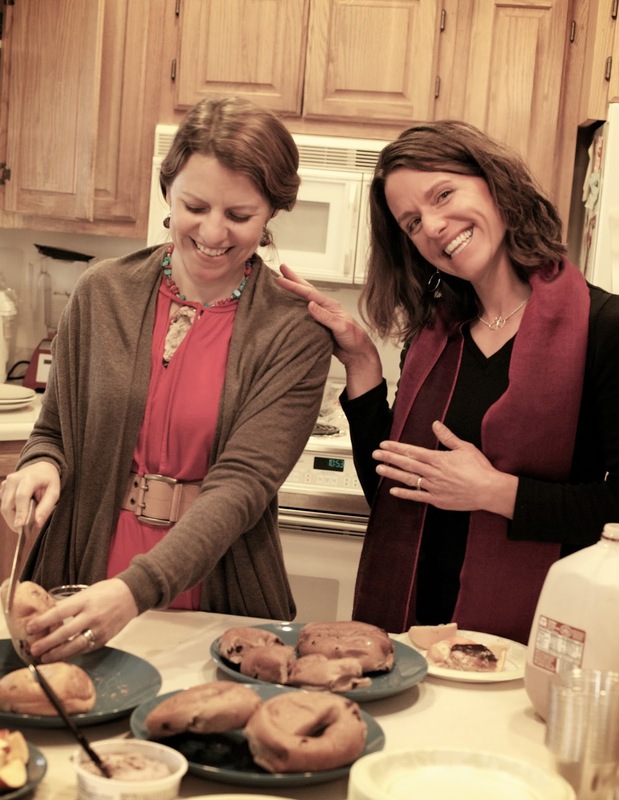 When I arrived [at Best Friends] she barely wanted to walk more that a few feet, said McIntosh. I'm into holistic animal care and so I put her on supplements targeting arthritis and inflammation, started physical therapy which consists of massage and range of motion exercises and now she does rather well considering what damage was done to her legs. Miss Brit spends her days and nights in the office. The floor is linoleum, so the pig was having a lot of difficulty getting traction and would slip often. With the biggest cooking day of the year looming, I always recommend using an anti-fatigue mat on your kitchen floor to ease those long hours standing. What else can you do to make sure your feet and back don’t suffer while you’re slaving over turkey dinner? Wear shoes. Comfortable shoes. I know you’re likely rolling that pie crust in the comfort of your own kitchen. But barefoot standing is hard on your feet. Pull out your most comfortable, supportive shoes and save the heels for the after party. Invest in an anti-fatigue or “cushion” mat. Your legs and back will thank you. As will the poor guy stuck at the sink washing dishes afterward. Take regular breaks to sit down and rest your legs. Stretch. Sample the stuffing. Shift your weight from one foot to the other periodically. Consider using a small stool or fat phone book to help you vary your standing position. When it’s all over, let the tryptophan do it’s magic. Elevate your legs and put your feet up on the couch. 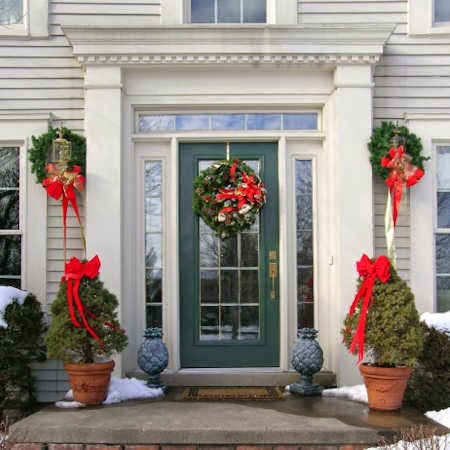 With holiday visitors, carolers and gift givers coming to your home or office, you want to make sure your entrance is clean, safe and attractive. 1. Thoroughly sweep and clean. Don't forget to clean baseboards and your door bell. 2. Use a quality door mat. Consider a bright red or green mat for the holidays. 3. Keep decorations to the side of your doorway and out of the walking path to avoid creating a tripping hazard. Make sure your decor doesn't hide the doorbell or door knob. 4. Be sure to shovel snow and de-ice to keep your entrance non-slip and safe. 5. Decorate! Simple bright ribbons or a wreath on the door can make your entrance inviting. Annoucement! Announcement! The StopDirt.com Rubber Brush door mat was crowned victorious by the Real Simple magazine's Doormat Road Test. The Rubber Brush mat beat all the competition in the outdoor mat category. The mat is excellent for scraping mud and gunk off shoes before it tracks into your rooms. Real Simple magazine aims to simplify your life -- and cleaning floors is certainly one hassle we'd all like to minimize. The full article featuring StopDirt.com's Rubber Brush mat comes out in the March issue of Real Simple. What causes yellow floors underneath mats? Moisture from the ground comes up through the floor until it reaches the floor surface. This moisture normally evaporates and goes unnoticed. Placement of a mat on the floor prevents the evaporation, therefore trapping the moisture, thus causing the discoloration. This seems to be most common at entrances where cold or warm air enters buildings when the door is opened causing condensation (sweating). Placement of mats on freshly cleaned and still damp carpet. This prevents carpet from fully drying, thereby causing discoloration. Moisture from the back of mats. If not properly dried, the back of mats can be damp, thereby providing moisture to cause discoloration. Lack of exposure to sunlight. It is possible to see floors change color when they are covered by counters, file cabinets, etc. This is caused by both lack of exposure to sunlight and restricted airflow. Avoiding these four moisture trapping situations will prevent discolored floors under your mats. If you already have damaged floor problems, discoloration can usually be removed by stripping and rewaxing. In the case of carpet, professional carpet cleaning is usually required. Our newest “employee”, Edie Louise Wilde, has arrived in all her screaming glory. So far, she hasn't proved very helpful at mailing samples or answering the phone... but she makes great background music for all my important phone calls. Edie was born July 31 and weighs in at 7 lbs 7 oz. Her big brothers and sister are enjoying her (a little too much sometimes....) and we think she's perfect. Just when I thought I'd seen it all in the world of door mats, here comes the ultimate nerd's mat. Leave it to the French (La Tete au Cube designed this mat) to come up with a dancing green alien door mat. A great way to flash back to those good old Atari days, but I'm not sure it is worth the $110 price tag. Is there a season for mats? Most people would agree that winter with its icy, wet weather is the most important time to protect your floors with door mats. However, even in summer weather, dirt and grime gets tracked through your doorways every day. And if your home is like mine, the ins-and-outs seem to increase in the summer season with better weather outside. If you are looking to put away your heavy winter mats, that is fine. But to protect your carpet and floors, continue using at minimum a lighter-weight dust removal mat such as the Classic Carpets or similar mat. Labels: Mats for all Seasons? The Andersen company has outdone itself! I've loved selling Andersen products and the Waterhog mat by Andersen has been my best seller for years. Now, I introduce the Clean Stride. This innovative mat is a piece of dirt stopping genius! The Clean Stride combines the tried-and-true dirt stopping power of the Waterhog mat on one end. Then the fine-dust and particle grabbing power of a "sticky" mat on the other end. · Provides a WaterHog surface at one end to scrape large particles. Then, the adhesive insert captures smaller dust & dirt. 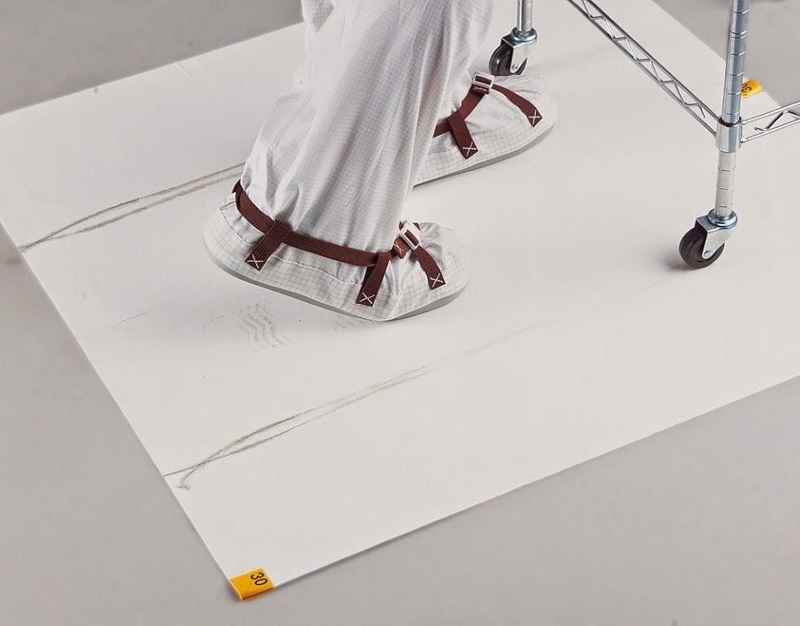 · With only two footsteps on the Clean Stride adhesive insert, 90% of dirt particles are removed. · Just peel off one of the 60-layers on the sticky mat, as needed. · Green friendly rubber backing has 10%-15% recycled rubber. · Ideal for factories, computer rooms, clean rooms, warehouses, school gymnasiums, healthcare facilities and more. How can I stop dirt at the door without using an "industrial" looking door mat? Thanks to some great forward-thinking mat manufacturers, you no longer have to sacrifice style for dirt-stopping door mat coverage. One of my best sellers for years at StopDirt.com has been the Waterhog. This mat comes with the option of a fabric border to soften the look and make it less industrial appearing. With the Waterhog Classic in the fabric border, however, you lose the famous Waterhog water-dam. So the Andersen company that makes the Waterhog, now has made an even better option in the Waterhog Premier which is available with the fabric border AND a built in water dam that is incorporated into the fabric's surface pattern. But your good-looking mat options don't stop there: Check out the Grand Premier mat. This one is available with a beautiful half oval sunburst. It has all the same dirt-stopping power that has made the Waterhog a best seller. But in a beautiful new pattern curved pattern. So don't fall prey to a "pretty" door mat that is going to be worthless in a few weeks. Choose a top-quality beautiful AND functional mat. What is the best way to clean my door mat? If you are like most people, you only think about cleaning your door mat about the same time is starts to look dirtier than your street. In other words, rarely. But with proper cleaning, your door mat will stop more dirt at your doors and last much longer. If your door mat is made with a nitrile rubber backing (such as those used in commercial mat services) you can toss the mat in the washing machine. Then tumble dry. Use a tiny bit of detergent -- preferably low-sudsing. Then pat yourself on the back for purchasing well! If your mat has a vinyl backing, you can clean it by hosing it off. Take it to the car wash, if it is in really bad shape, and really blast it! If your door mat is all-rubber, again, just hose it off. Most good quality door mats can be spot cleaned with the same treatments sold for carpets. Test a tiny spot first. If you get ground-in gum, use a citrus cleaner or "GU Gone." A good supplier is DE Davis and Co. If you get really desperate, give the mat a little "hair cut" and just trim out the gum. Always vacuum your door mats between cleanings to keep them working well. If you have a natural coconut shell or coir door mat, I have bad news for you. There is nothing you can do to clean it. These mats get nasty and moldy over time. Replace your coir door mat with a better one! 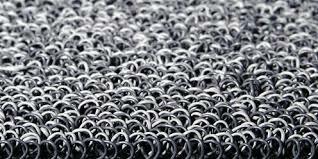 How many feet of matting do I need for optimum coverage? 1. 70 to 80% of interior soil is brought into the facility from foot traffic. 2. 15 feet of matting is required to remove the majority of dirt and moisturefrom foot traffic. 3. 15 feet of matting allows each foot to make contact with the matting at least 3 times. 4. A minimum of 15 feet of matting ensures that the majority of soil will be stopped at the entrance. You think door mats aren't exciting? Most people laugh when I tell them that I sell door mats for a living. You're kidding, right? No, I'm not kidding. There is good money to be made in door mats. Just think how many doors there are in your home, not to mention all the commercial entrances. Without proper coverage, carpets and finishes can be destroyed. Door mats are such a easy maintenance investment. I've been an online door mat seller for 6 years. Prior to entering the e-commerce scene, I ran a door mat laundry service. Again, You're kidding, right? is the general reaction I receive. But after eight years in the "dirt" industry, I've learned just about everything there is to know about stopping dirt at your door. 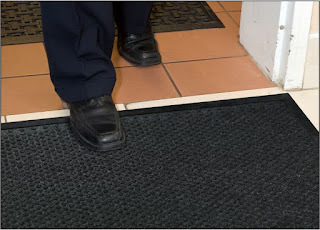 So if you are one of those people who think door mats aren't exciting, here's a little tidbit that just might change your mind: Without entrance matting, 1500 people walking through your door can remove 42% of the finish from the floor. I hope you'll find this website informative, interesting and helpful. I am always open to questions and suggestions. Thanks for visiting. Entryways of Airports, Hospitals, Department Stores, etc. Entryways of Doctor's Offices, Boutiques, Small Offices, etc. THE DIRTY FACTS!!! why do we need mats? The Library of Congress has 322 books on dust. The University of Wisconsin offers a course on the subject of Dust Control. Rugged construction of heavy-weight fabric and durable cleated rubber backing. 25% heavier than the regular waterhog mat. Anti-Static polypropylene fabric that dries quickly and won't fade or rot, even outdoors. Your choice of fabric or rubber border.